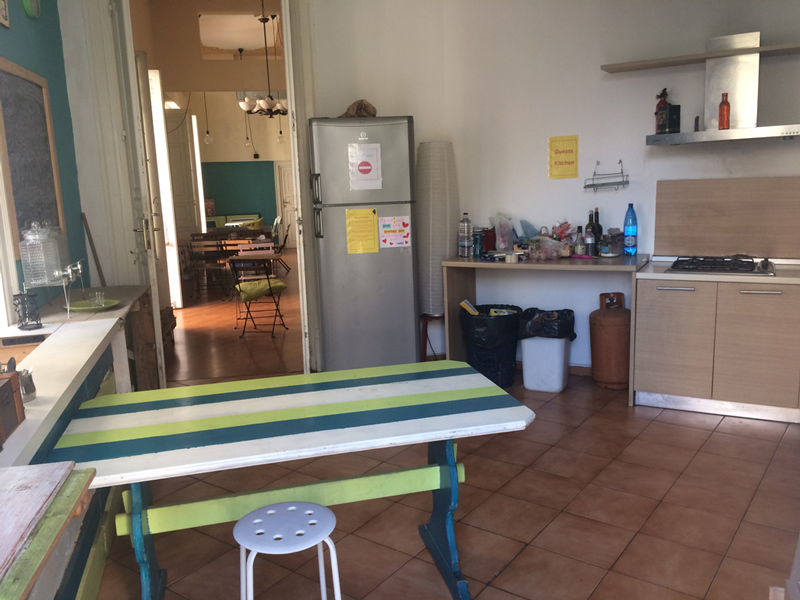 Coincidentally, as I was about to write how much I am enjoying my time at the On the Way Hostel in Palermo and recommend it to fellow and future travelers, I received a request as press to rate the friendliness of some cities. Had Palermo been on the list I would have given it 5 out of 5. 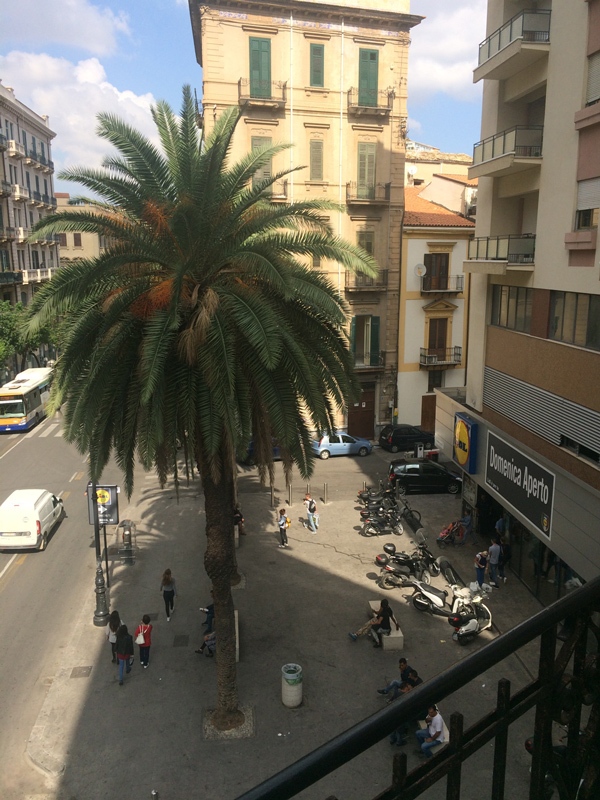 In Sicily, I have stayed in both major cities, Catania and Palermo and I have very much enjoyed my time in Palermo. I am sure this is, in great part because of the friendliness of the On The Way hostel. 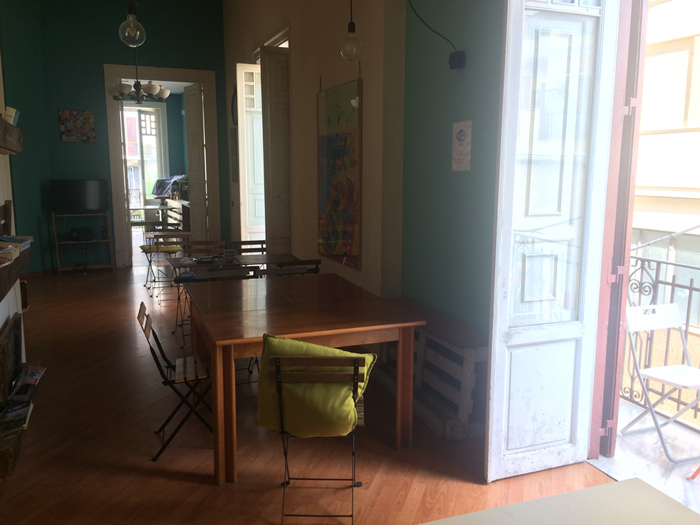 As an independent traveler, I (and so many others) appreciate it when a hostel becomes “home.” It’s great to be well greeted. It’s terrific when you have that friendly greeting each morning when you emerge from your room or arrive back after an oft-tiring day. On The Way Hostel is exactly that for me now, and for my fellow travelers I have known as they have come and gone these couple of weeks. I love waking in the morning to the smiling greeting from Yurena or Maca or to return each evening to a genuine greeting or conversation with Matt. (I know when you stay here you will meet different people but my hope is that you have people as great as these three. The On The Way Hostel (left). Palermo Centrale Train station down Via Roma in the background. The front desk is visible as you walk in. Arriving during the day, I was greeted by Massimo, the owner himself. I had communicated with him via WhatsApp a few weeks before I came and then contacted him the night that I was unable to arrive, so I was expected when I finally did arrive. Early morning view from a dorm balcony at On The Way Hostel. I immediately noticed that my 4-bed woman-only dorm had a private balcony with classic iron and a small wooden table with a pair of chairs. I soon came to notice that these balconies were common in this hostel and I made great use of mine. Happily, there are private lockers for each person. My lock wasn’t the right type (Massimo and I tried it) but for €2 that was easily rectified. It’s great to know my things are secure during any stay anywhere. A locker can also act like a convenient closet. At some point that evening I met Matt and instantly liked him. 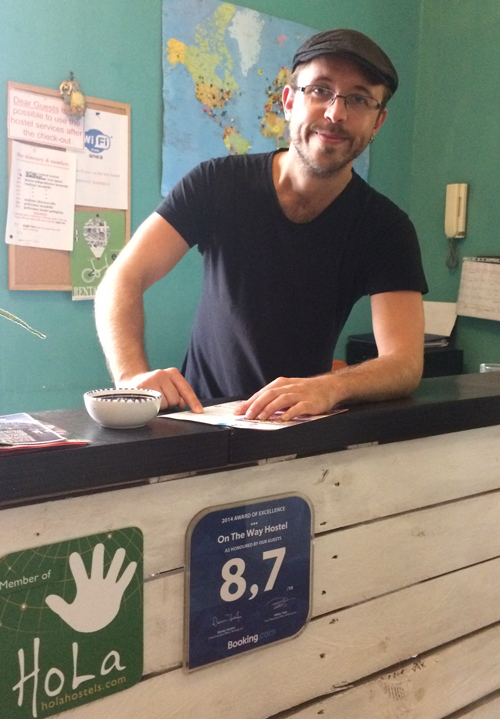 He was the perfect person to be behind a hostel desk: that magic mix of professional and friendly. Directions or information if he doesn’t know he looks it up. And when he is on duty he is truly there. No need to go searching for someone on duty. In the morning I went upstairs for the free breakfast that comes with a stay there and Maca, a bubbly but not overly-so young woman from Spain asked if I’d like coffee. “Si si!” “Italiano or Americano?” “Italiano.” This is service! I also loved the bowl of fruit, passing on the variety of cereals, milk, juice, the toast and jams and the Italian cookies. (These two women are also right on top of things and are always on duty where they are supposed to be.) 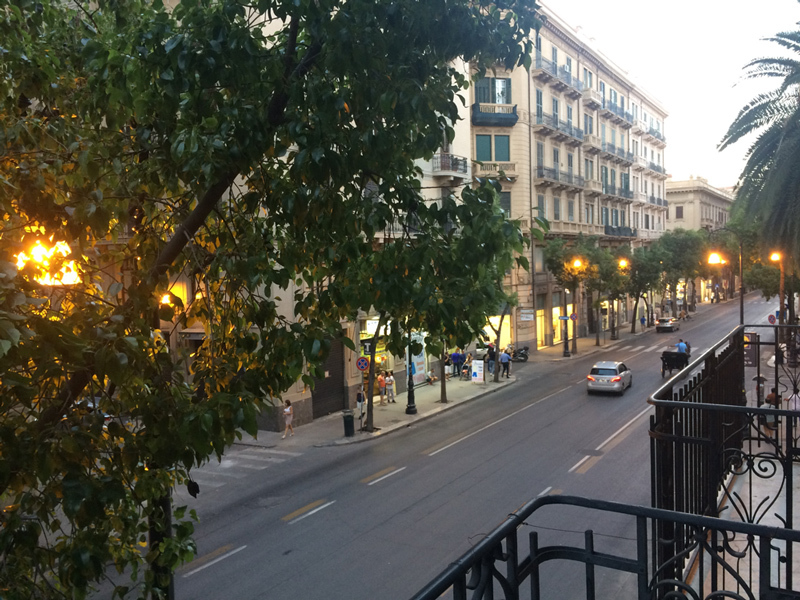 Coffee is even better on a private balcony overlooking a traditional small Italian alley or the main street, Via Roma, on which On The Way Hostel is located. Each day has been like this for me. Great greetings and info from Massimo and three terrific helpers. Breakfast, fresh coffee and enjoyable people who make me and others happy to be there. I love that the bathrooms are actual home-style bathrooms. That’s always a bonus of a home that acts as a hostel. I also love that there are clean hand towels in each of the two bathrooms on the main floor. I’d prefer it if the shower room could have a dry private dressing area. People seem to get around this by showering when not many others are around. LIDL supermarket seen from On The Way Hostel balcony. 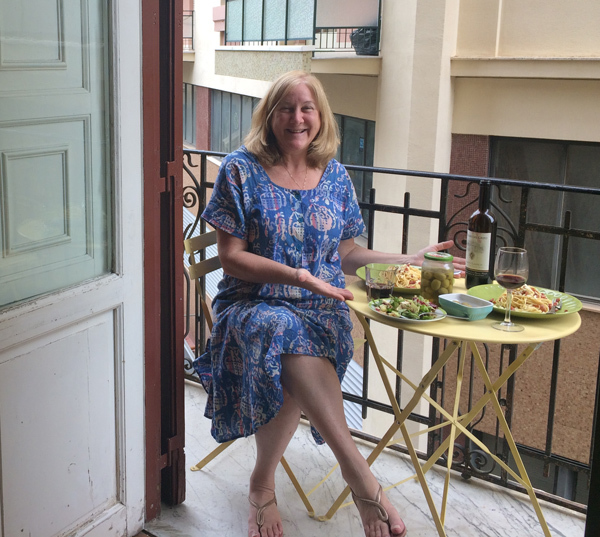 Dinner with a fellow guest on a dining room balcony at On The Way Hostel in Palermo. I have seen some great creations come out of that kitchen — and been invited to enjoy some of them as you can see. In my time there I have enjoyed great conversations, several with the bright and amiable Matt, and a few while enjoying the fresh balcony air. 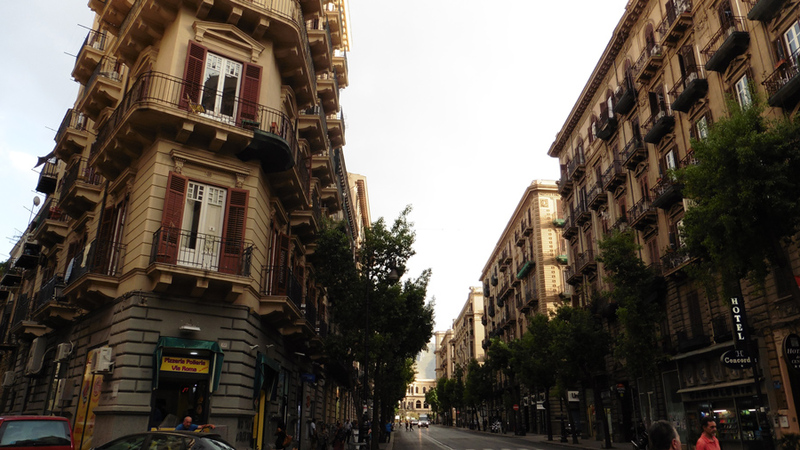 This was one of the harder hostels to leave. One tip I must offer you about staying here is one I will commonly offer: bring soft foam earplugs. 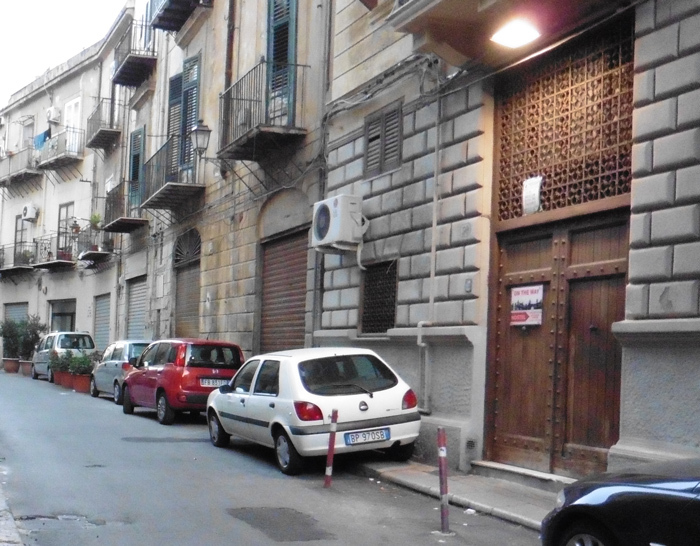 Being fantastically located on Via Roma also means experiencing the sounds of life on this main street. However, there will be times you prefer to remove yourself from those sounds and curl up for a good sleep.